When talking about places we love, we can’t go past the Daintree. With some of the oldest surviving tracts of rainforest on the planet, and high diversity of plant and animal species, it really is a special place and one that’s well worth looking after. There are still many pressures on the Daintree including further development, vegetation clearing, introduced species, and now the possibility of electricity grids. On 6 December 2012, the Queensland Government announced that it had repealed the Daintree Policy – a 12 year old policy that prevented mains power or energy networks being built in the Daintree. This change means that residents and businesses will be allowed, with approval from the Queensland Energy Regulator, to install their own isolated networks – power generators that can be used by more than one premises. The government has been careful to state that they will not be paying for a new energy supply in the region and that the area will not be part of the Ergon grid, and previous studies have showed that connecting mains power to the area is cost prohibitive. However, in theory the rescission of this policy opens the way for the extension of mains power to the Daintree. The cost of underground power is high, so there may potentially be poles and wires within micro-grid areas. The rescission of the policy is likely to encourage development, which will increase cost of land and make buyback more difficult. Under current planning regulations another 180 houses can be built in the Daintree. 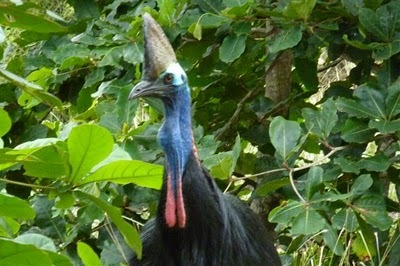 The remote nature of the Daintree is what appeals to tourists. Any electricity microgrid infrastructure must be carefully designed to preserve this. The policy change presents a great opportunity for creating renewable energy microgrids. It is important to note though, that not all of the microgrids installed will be renewable and the environmental benefits of installing a diesel microgrid system for numerous properties may be fairly minimal as compared to using a diesel generator for each house, plus infrastructure would be expensive and possibly with detrimental aesthetic and environmental outcomes. With the current and projected price of diesel, renewable energy is significantly cheaper to operate over the longer term. Though capital costs for a renewable energy system and microgrid are significantly higher that installing a diesel generator the pay back periods are likely to be in the region of a few years with good design and planning. Incentives and/or low interest finance could be made available. With good design renewable energy micro grids are generally more dependable and reliable than diesel. Establishing renewable energy microgrids would reduce use, transportation and storage of diesel fuel for generators and result in much cleaner energy sources for these communities. Given the geography and climate of the area, renewable energy generators may be micro-hydro. There are a number of general principles which will guide our position on the issue of power supply in the Daintree into the future. No further mains power north of the Daintree River. Renewable energy micro-grids are prioritised over diesel generators. Incentives developed and provided to reduce the burden of high capital costs of renewable energy microgrids over diesel. The development of basic design standards for renewable energy microgrids to ensure robust design and ensure long term reliability and minimal environmental impact. Microgrids are only installed where they will improve efficiency and will not have negative impacts on native vegetation, wildlife or visual amenity. The Daintree really is too precious to lose to development. While energy efficiency and liveability for existing communities are important considerations, preservation of the internationally significant biodiversity values of the Daintree should be given high priority. After all, that’s what brings tourists and locals alike to the Daintree in the first place.